The statistics bear it out - color improves brand recognition up to 80%, and increases readers’ attention spans and recall by more than 82%. So why do many of us still think color is too costly for everyday use? The fact is, today’s high-resolution color printers can provide superior quality and a high return on equipment investment, not to mention the savings that come from keeping projects in-house. When it comes to marketing materials, 55% of recipients are more likely to pick up a full-color piece of mail first. And when it comes to actually reading or rejecting a brochure or direct mail piece, color can make the crucial difference (in the 2.5 seconds of deliberation) of whether it stays on the desk or goes in the recycle bin. The colorful way to save If you’re printing a letter with black ink on pre-printed color letterhead, it costs less to simply print the letter along with your logo in color on a plain sheet of paper. Similarly, if you’re printing a small amount of color on a document to highlight one portion, the cost of color is negligible. A small amount of color on quotes, training materials, sales literature, handouts and reports can significantly improve their impact and response. Color prints also produce 70% faster search times in helping readers locate information. The green light Consistency is important when it comes to your professional identity. Color can help you create your own look and feel in your branding. Establishing your own “brand guidelines” which reflect your fonts and logo colors make it clear who you are in each and every communication you have with your audience. Seeing red? In the era of sensory marketing it helps to always be aware of your image. Consider what you want others to associate you and your business with, knowing that the first impression is the most vital. In addition to communications, think about the color of your office and in what you wear; research shows the physiological effects of color on both the wearer and observer correlating to likeability and professional capabilities. With flying colors You can help your customers and your employees with color in a number of ways. Detailed documents such as contracts or research or training materials can be made easier to read with color. And when customers spend less time contacting you or your customer service team with questions, your productivity increases. Color also reduces errors by 80%, cutting down on the time it takes to correct improperly filled out forms and applications. In study after study, color proves its value time and time again. 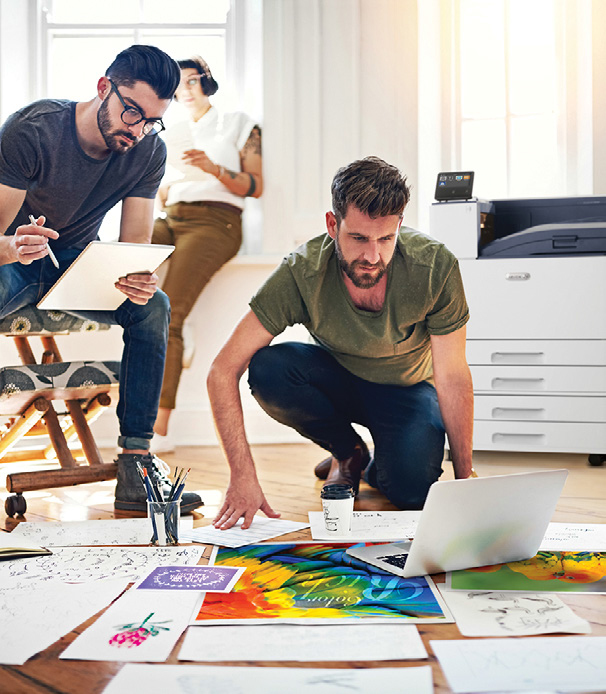 Rhyme offers quality, high-resolution color printers that can help you bridge the color gap without increasing costs or interrupting the way you work. Contact us today! More and more, ransomware has emerged as a major threat to individuals and businesses alike. Ransomware, a type of malware that encrypts data on infected systems, has become a lucrative option for cyber extortionists. Using the correct labels for your device and avoiding common mistakes will increase your workflow and prevent service calls and repairs to your device due to improper use and materials. The voice-command technology you use to make life easier at home is now coming to the business sphere. Learn more about how these innovations can simplify your workday so you can spend more time on the important things.